Firefighters and water-scoopers jumped into action Saturday morning to catch spot fires from the Chistochina River Fire (#381). On Friday, firefighters on the ground and the four water-scooping Fire Boss airplanes stopped the fire 75-100 yards from nearby homes and the highway. Today, Fire Boss aircraft dropped water from the air while firefighters used hose on the ground to wet the perimeter and enforce the saw line after it became active at about 11 a.m. 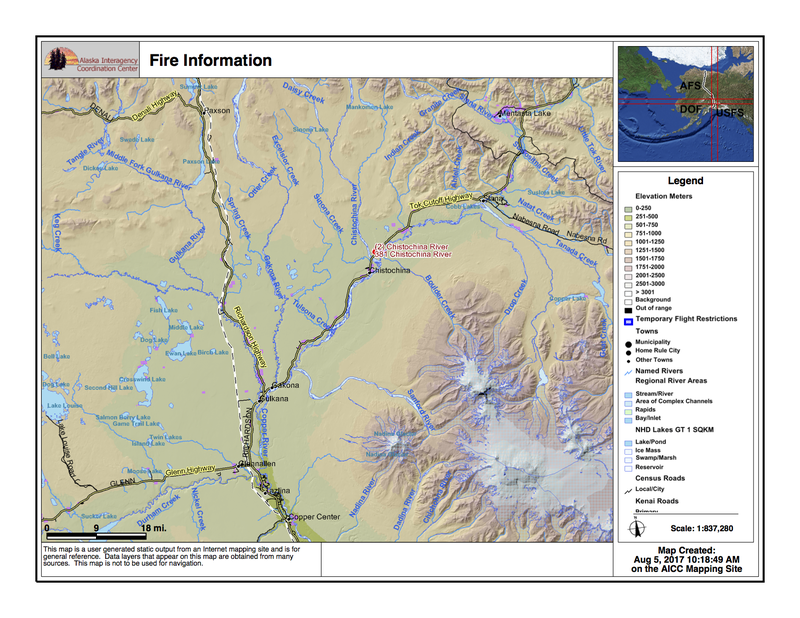 The fire is estimated to be 98 acres and is burning on the west side of the Tok Cutoff near mile 36.5. It took them three solid hours of work before the fire was knocked down. The spot fires were near the east flank at the heel of the fire. The Type 2 University of Alaska-Fairbanks Nanook Fire Crew started working on the fire by about 1:30 p.m. with the 16-person Type 2 Minto Crew joining in the battle to suppress the fire Saturday evening. Another Type 2 emergency firefighter crew is arriving from Marshall on Sunday. There are also two Alaska Division of Forestry engines and personnel, plus a tender and accompanying personnel from the Gakona Volunteer Fire Department with one more on the way from the Kenny Lake Volunteer Fire Department. They’ll continue to cut saw line and put in a hose lay around the fire. Eight of the 16 BLM Alaska Fire Service smokejumpers that were part of the initial attack were demobilized Saturday. Firefighters and aircraft are able to stage away from the Tok Cutoff and are not impacting traffic at this time. However, that could change if activity picks up again. The fire is visible from the highway. Motorists are urged to use caution when driving through the area. For more information, contact BLM AFS Public Affairs Specialist Beth Ipsen at (907)388-2159 or email eipsen@blm.gov.